The made-for-TV band’s film opus “The Monkees – Head” stretches across a rainbow of genres and homage while fully engaging in deep Eisenstein-ian anti-propaganda. It bears the marks of growing pains, restlessness and youthful antagonisation of the machine. It aims to break The Monkees out of their life-size doll exoskeletons. It’s “A Hard Day’s Night,” Vietnam, Norman McLaren, self-aware shatterings of the fourth wall and more drugs tossed in a blender on high speed attached to a gyroscope in a tornado. It’s insanely fun and biting. Writer Jack Nicholson, who would become a Raybert Productions/BBS Productions renaissance man before skyrocketing as a top Hollywood lead, crafted this temple to the dandruff of Old Hollywood on LSD while living in the basement of Harry Dean Stanton. The marketing for a film that was too incoherent for youngsters and too plebeian for the era’s cineastes consisted mostly of half-baked commercials and stickers of Rafelson’s face. “Head” launched itself into a barren no-fly zone. She scoffs, “Are you kidding?” and exits the apartment. This mildly sensual interaction is essentially the writing on the wall for what annoyed The Monkees during their two-season television show. It’s what they would tear down for the next 80 minutes. 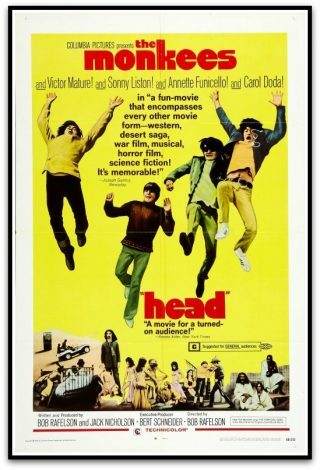 The Monkees’ ‘Head’ proved a box office dud during its initial release. They were sick of being “God’s gift to the eight-year-olds” and “paying tribute to Ringo Starr,” as a diner server articulates in a later scene. There’s a real sense of paranoia and claustrophobia throughout, constructed in the many bizarre settings of black boxes, manufacturing plants, vacuum hoses and yes, Victor Mature’s hair. In the first concert scene, Micky’s plain white bass drums read “DRUM,” representative of the most basic commodification – like the “BEER” we later see in the similarly prickly “Repo Man” (which Nesmith executive produced). They were anxious to shed their own label as “product.” They were outselling The Beatles and The Rolling Stones. “I’m A Believer” was a persistent chart topper. On paper they were the real deal and desired to be accepted as such. Dolenz claimed that piecing together the origins and motivations behind “Head” resembles “Rashomon.” Regardless of subtextual finger pointing from various parties involved, “Head” illustrates the band members’ sensibilities and emotions explicitly, intentional or not. Sometimes ironically as when Peter dips into an angelic moment of deconstructing his television persona, “I’m the dummy. I’m always the dummy”- to Mike who is completely over it, phoning in his performance, minus his wild birthday party scene where he derails the trippy a-go-go in a frustrated, eternal, parental damning of the unwanted groovy. To stick the knife deeper into the lungs of “Classic Hollywood,” the casting of troublesome boxer Sonny Liston, nudie dancer Carol Doda, wildman outcast/proto-John Turturro Timothy Carey, sage-like Frank Zappa and many countercultural others was another step up the “F. U.” ladder. Later in the film, Jones’ escape from the manufacturing plant, kicking all those who try to stop him down the stairs, echoes of director Rafelson’s real life response to a meddling producer. 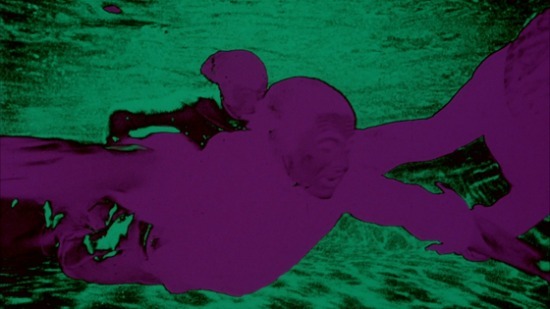 “The Monkees – Head ” is bookended by the group diving off the Gerald Desmond Bridge lemming-like, dunking into the water that Tork later hoped symbolized escape for he and his mates. With its utter failure representing an obvious beginning of the end for The Monkees until reunions in later decades, its cult status has endured and cemented it as a wonderfully crafted work of art and, sometimes surreal, history. Steve Bessette is the Creative Manager of the Alamo Drafthouse Cinema Littleton.